On 2 February 1990, the South African state president, F. W. de Klerk, announced the unbanning of the ANC, the PAC and the South African Communist Party; this changed at a stroke the environment in which Mozambique’s slow peace process was operating. Indeed, as President Joaquim Chissano pointed out later in the month, the logic by which South African support for Renamo was seen as a counterweight to Mozambican support for the ANC, had suddenly disappeared. 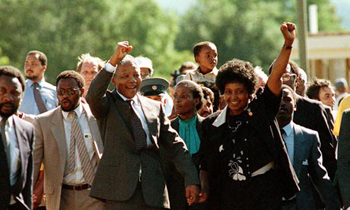 Above left: Nelson Mandela and Winnie Mandela on 11 February 1990, as he was released from 27 years of imprisonment. 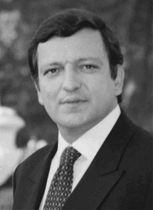 Above right: José Manuel Durão Barroso (b.1956), then Secretary of State for Foreign Affairs and Cooperation. Durão Barroso was especially active diplomatically in Angola and East Timor during this period; he was less active in the Mozambican negotiations, but still played an important role. Towards the end of March some reports appeared confirming that the United States was to have an ongoing mediation role. This eventually turned out not to be the case. Enrico Fedrighini. Da Luanda a Maputo, passando per Pretoria. Nigrizia [Verona] (February 1990), p.14-16. In Italian. Click here to download a PDF file, size 300 kb. Includes a box by Alfredo Bellini with an exclusive interview with Joaquim Chissano, dating from late October 1989, which took place in S. Luís do Maranhão, Brazil. Karl Maier. Hope flourishes in peace. Parade [Harare] (February 1990), p.12-13, 15, 39. In English. Click here to download a PDF file, size 666 kb. Maier took a train journey to Nacala, and also interviewed Afonso Dhlakama, leader of the MNR (see page 15). Portugal urged to play role in Mozambican peace process. Herald [Harare] (6 February 1990). In English. Click here to download a PDF file, size 44 kb. The story refers to José Manuel Durão Barroso as José Barossa [sic] throughout. Durão Barroso, who had attended a SADCC meeting, paid a courtesy call on President Mugabe, who told him that he hoped Portugal would continue to play a positive role in southern Africa. Mozambique: Chissano on hopeful signs for peace. Radio Mozambique broadcast on 7 February 1990 printed in the Summary of World Broadcasts [London]. In English. Click here to download a PDF file, size 17 kb. Chissano is quoted as saying that the peace process will take time because people want «real, safe and definitive peace». Guy Arnold. Light at the end of the tunnel for Mozambique. Herald [Harare] (8 February 1990). In English. Click here to download a PDF file, size 102 kb. Mozambique: moving with the times. Africa Confidential [London] vol.31 no.3 (9 February 1990). In English. Click here to download a PDF file, size 178 kb. Moçambique: entre a paz e as tensões. Informáfrica [Lisbon] no.12 (10 February 1990), p.7. In Portuguese. Click here to download a PDF file, size 109 kb. Portugal tem responsibilidade histórica na busca da paz, afirmou o presidente da Renamo entrevistado pela Radiotelevisão. Século de Joanesburgo [Johannesburg] (19 February 1990). In Portuguese. Click here to download a PDF file, size 33 kb. Afonso Dhlakama interviewed by RTP, wants Portugal to take an active role in negotiations. Chissano declara-se disposto a reunir com a Renamo. Século de Joanesburgo [Johannesburg] (20 February 1990). In Portuguese. Click here to download a PDF file, size 119 kb. 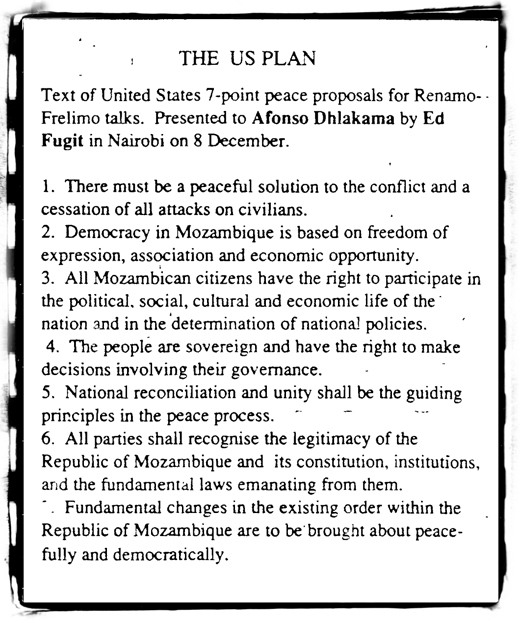 Above: In February the London-based newsletter Africa Confidential reported that the George Bush administration has presented its own seven-point plan in December, but that Afonso Dhlakama had ‘tossed it away’, objecting at that time to the requirement that the MNR recognise the legitimacy of the Mozambican republic. Chissano hopeful on end to war. Southscan [London] (23 February 1990). In English. Click here to download a PDF file, size 28 kb. Há progressos na busca da paz para o nosso país, afirma o ministro Mocumbi no seu regresso da reunião da OUA. Notícias [Maputo] (27 February 1990). In Portuguese. Click here to download a PDF file, size 607 kb. Mozambican president says MNR rebels are changing their attitude towards talks. Radio Mozambique broadcast on 28 February 1990, printed in the Summary of World Broadcasts [London]. In English. Click here to download a PDF file, size 43 kb. Mozambican president comments on possibilities for dialogue with rebels, national debate on possible multi-party system. Partial translated transcript of a news conference broadcast on 1 March 1990, published in the Summary of World Broadcasts [London]. In English. Click here to download a PDF file, size 67 kb. Mozambique: Algerian mediation. Indian Ocean Newsletter [Paris] (3 March 1990). In English. Click here to download a PDF file, size 34 kb. Algeria may intervene to try to persuade some Arab countries to stop supporting the MNR. In addition, Chissano claims that contact has already been established between the government and Renamo. Washington participating in negotiations. Indian Ocean Newsletter [Paris] (3 March 1990). In English. Click here to download a PDF file, size 26 kb. Reports remarks by Pascoal Mocumbi. António Marujo. Missionários criticam beligerantes de Moçambique: nem Frelimo nem Renamo. Público [Lisbon] (3 March 1990). In Portuguese. Click here to download a PDF file, size 129 kb. Harsh criticism of the peace process, the government, Renamo, and the Catholic hierarchy by the Comboni missionaries. MNR claims no impasse. Southscan [London] vol.5 no.9 (9 March 1990), p.70. In English. Click here to download a PDF file, size 41 kb. Chissano hails US efforts. Herald [Harare] (15 March 1990). In English. Click here to download a PDF file, size 31 kb. Charles W. Corey. Mozambican government to hold talks with Renamo. United States Information Agency [Washington DC] (15 March 1990). In English. Click here to download a PDF file, size 146 kb. Report on a press conference held on 15 March 1990. Em Moçambique Joaquim Chissano avança para a paz. Diário de Notícias [Supl. África] [Lisbon] (16 March 1990). In Portuguese. Click here to download a PDF file, size 66 kb. Pace of war and diplomacy quickens on threshold of Mozambique peace talks. Southscan [London] (16 March 1990). In English. Click here to download a PDF file, size 105 kb. This page was first posted on 11 July 2013.